The Ralstonia-GG-Kit contains a set of backbone vectors and Level I modules that can be used for assembly of Ralstonia solanacearum species complex gene knockout and complementation constructs based on the Golden Gate cloning techniques. 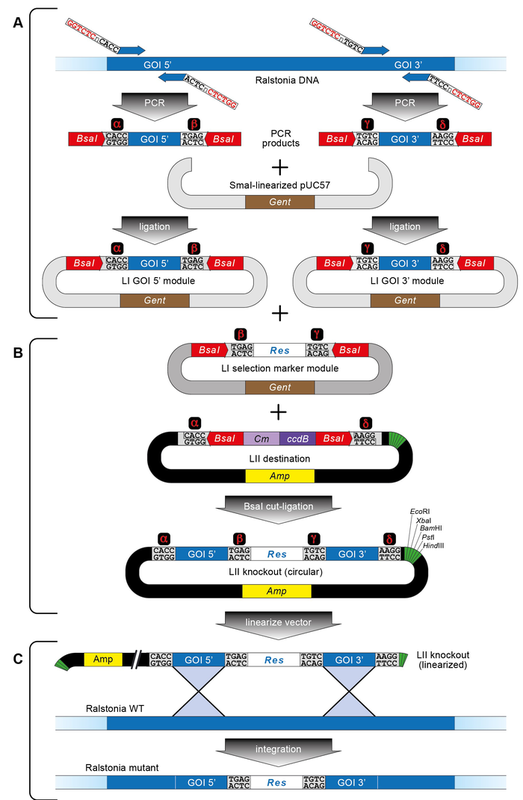 A modular toolbox for Golden-Gate-based plasmid assembly streamlines generation of Ralstonia solanacearum species complex knockout strains and multi-cassette complementation constructs. Wu D, Schandry N, Lahaye T. Mol Plant Pathol. (2017) doi: 10.1111/mpp.12632. PubMed PMID: 29077245 . The Ralstonia-GG-Kit contains a set of backbone vectors and Level I modules that can be used for assembly of Ralstonia solanacearum species complex gene knockout and complementation constructs based on Golden Gate cloning techniques. LI modules includes R. solanacearum species complex specific promoters, N-terminal and C-terminal tags, reporter genes, terminators and resistance genes. This toolkit enables the simultaneous integration of up to five expression cassettes into a user-chosen site of the genome. In combination with the previously published plant golden gate toolkit (Binder, A, et al. (2014) ; Martin Parniske Lab plasmids), it also provides a straight forward way for scientists to express R. solanacearum effector proteins in plants.